As someone who grew up going to Tower Records once a week as a child, I've always enjoyed buying and collecting music. There's a few record stores in San Diego that I like, but my favorite by far is Record City in Hillcrest. I've been coming to Record City for around four years now and it's been my go-to record shop to support on Record Store Day. 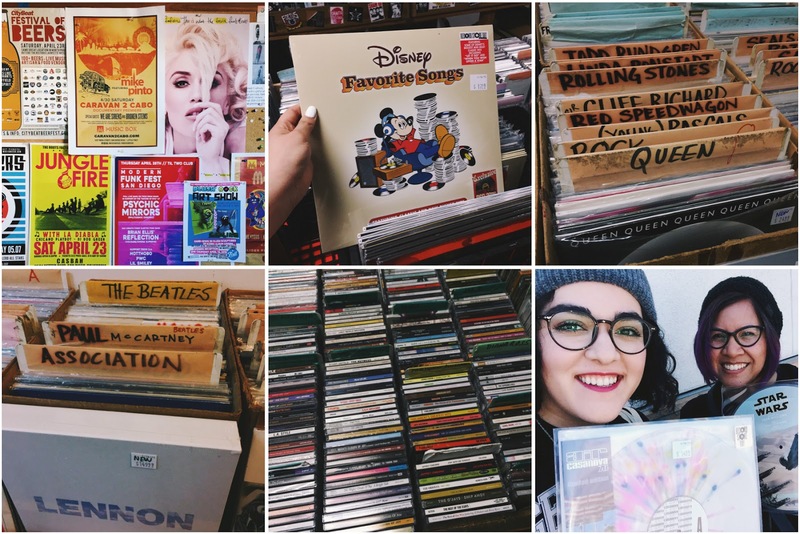 If you've been following my blog for some time, then you know how passionate I am about supporting local small businesses and this store combines both my love for music and small businesses. The store itself seems like it's stuck in the past, but that's exactly what I love about it. There is no fancy decor here, no pretentious employees who judge your taste in music, and no social media accounts to tag in your Instagram pictures- all you get is music and tons of it! Record City is located in 3757 Sixth Ave, San Diego, CA 92103 right across from the Rite-Aid in Hillcrest. This place is easily missed by many people due to it's location, but once you find this place it'll be hard to leave. You can find thousands of both used and new vinyl records, CDs, DVDs, and music memorabilia. It's truly a music aficionado's dream come true, especially if you're nostalgic about music from the 70's and 80's. One of my favorite things about Record City is the variety of music available on vinyl. There's everything from country, rap, funk, punk, and even soundtracks. And if you're a fan of contemporary indie/alternative music, then you'll be able to the latest releases along the wall. All the records are organized in cardboard boxes, so expect to do a little crate digging to find some gems. Most record shops will completely disregard used vinyl or the infamous "bargain bin," but at Record City every vinyl purchased comes in a plastic sleeve. They're very particular about the pre-owned records they to buy from people, so they won't put anything on the floor that is in poor condition. The prices are also very reasonable for both used and new vinyl. Out of all the record shops in San Diego that I've visited, I find their prices to be the most reasonable. And like I previously mentioned, there are no pretentious hipsters working here to judge your taste in music or your appearance. I know, it sounds quite ridiculous but there's a record store in San Diego that always seems to have very unamused employees working there. Even if you don't know a thing about vinyl records, you can rest assured that the staff here will be nothing but helpful. If you happen to live in San Diego or want to make a trip to celebrate Record Store Day here, do it! Record City treats RSD like a party, there's always free soda and the owner always orders boxes of pizza for the customers. Plus you run into some great people at this shop, like my friend Cy from the blog Any Second Now who's been a huge Depeche Mode fan since the 80's. Like I said Record City doesn't have much of a presence at all online, they only have a Facebook page that hasn't been updated since 2013. If you want to learn more about the shop and the music carried here, I'd highly recommend you to visit Record City in person. Do you collect vinyl or CDs? Let me know in the comments below. I'd also love to know about your favorite record store if you have one.